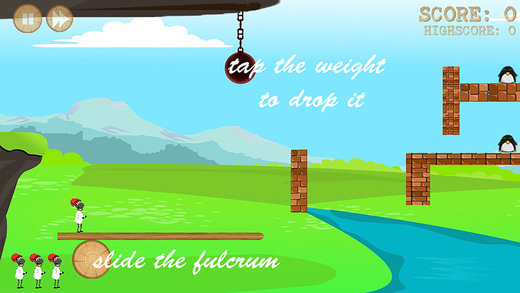 If you enjoy physics-based games like Angry Birds, you’ll definitely like playing ChuckTheSheep. Developed by Intelligent Apps, this brand-new iPhone game adds twists of its own and is both difficult and addicting. Though ChuckTheSheep seems to be inspired by Angry Birds, I can honestly say that it’s much, much more challenging. There are a variety of elements to take into consideration while playing, which increases the gameplay difficulty significantly. To play ChuckTheSheep, you have to slide the seesaw fulcrum (which looks like a log) to adjust the center of balance. Next you have to tap the swinging weight at the top of the screen. When the weight hits the plank, your sheep will be sent flying. The goal is to avoid brick walls and hit obstacles in hopes of freeing the captive penguin. At first I thought this sounded easy, but it took me quite a long time to get used to the physics and mechanics of ChuckTheSheep. There are so many things going on when it comes to trying to make your sheep land where you want him to, including the swinging weight and figuring out exactly when to tap it. When it comes to graphics, ChuckTheSheep is nice to look at and features rich environments with lots of stuff going on in the background. The physics engine is great, as well. Sound effects and background music really enhance the overall gameplay experience. The game is level-based and currently features 36 levels of increasing difficulty. It looks like the developers are planning on releasing new levels regularly, which is definitely good news for players who zip through ChuckTheSheep. 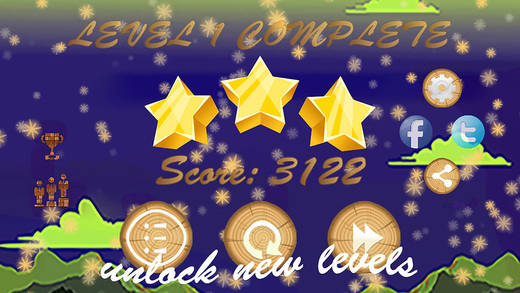 Also, players receive a 1 to 3 star rating when a level is completed. Game Center is heavily integrated and players can earn achievements, as well as compete with others across 6 different leaderboards. This is great news for anyone who enjoys climbing to the top of the rankings or challenging friends for high scores. There are in-app purchases for unlocking all levels, as well as unlocking the next level if you happen to be stuck on your current level. The price to unlock all levels is $4.99 and unlocking the next level is $0.99. However, there’s a free version of ChuckTheSheep available if you want to try the game before you commit, and it can be found on the App Store here. All in all, ChuckTheSheep is definitely a fun and addicting physics-based game for iPhone. It’s challenging, though, so be prepared to to get your wool a bit ruffled. ChuckTheSheep requires iOS 6.0 or later and is compatible with iPhone, iPad, and iPod touch. This app is optimized for iPhone 5.